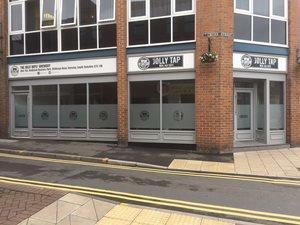 The Jolly Tap07939439166work BarTHE JOLLY TAP is a hidden gem in Wakefield's exciting and developing real ale and arts scenes. Not only do they offer a rich array of their own JOLLY BOYS' BREWERY ales, but also offer the best of locally sourced lagers, gins and wines. Coupled with this is exclusive food offer of delightful platters, pies and afternoon teas - all served up to 8pm. The JOLLY TAP opened in August 2017 and has enjoyed sealing its reputation as the place to be if you want to meet up with friends and family, have that quiet romantic bottle of prosecco, or simply have a laugh doing our weekly #JollyQuiz on Wednesdays. They even have live #JollyMusic events featuring the best of local talent. The Jolly Tap produces a monthly journal of events, ale information and offers in the form of On Tap that can be picked up from the bar or found on our Facebook pages @JollyBoysRealAleCafe. JollyBoys' Brewery real ale is brewed in Barnsley, South Yorkshire. We are supported by CAMRA and can be found at festivals and other events.